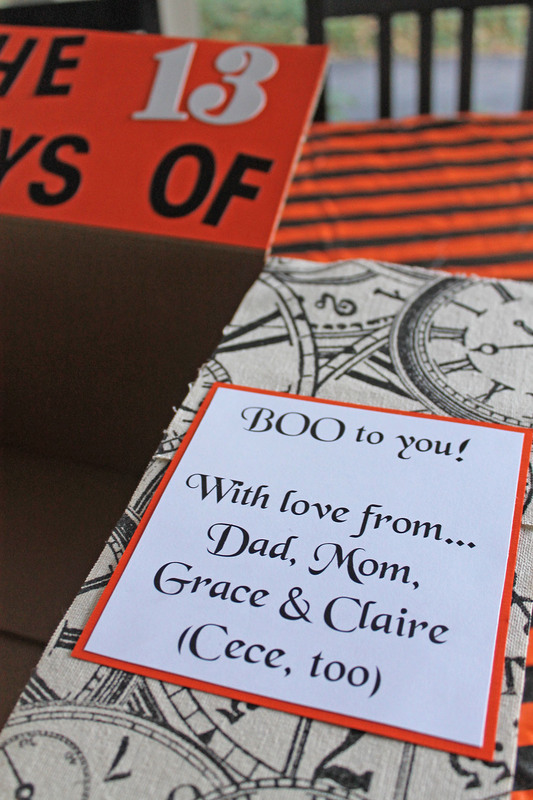 Last month I shared a fun and preppy care package that I sent to my oldest daughter who started her freshman year of college this year. 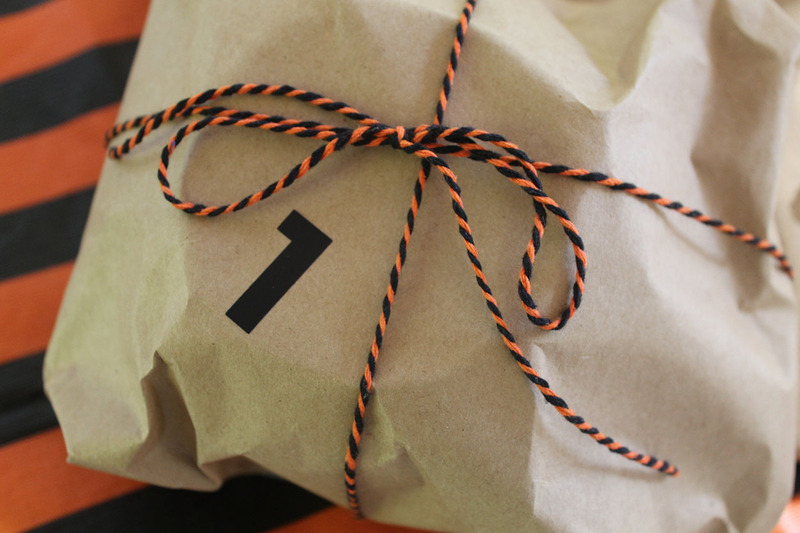 If you missed that post, click here for the details. 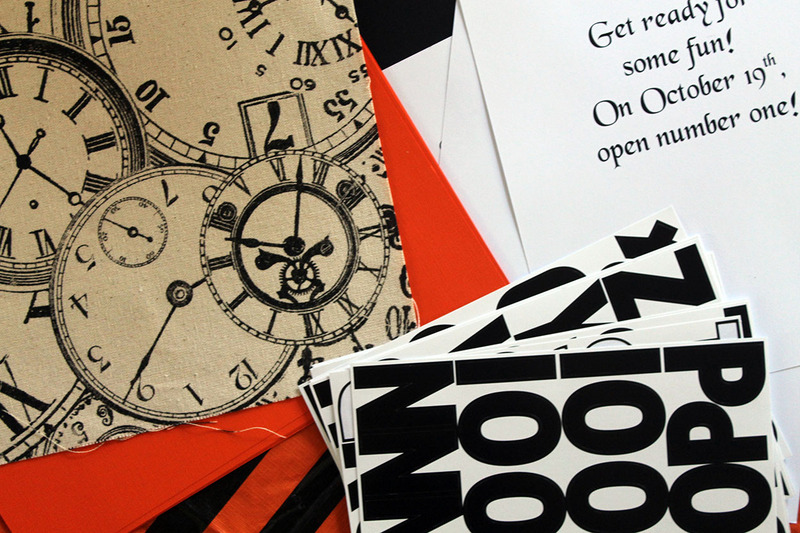 I love putting surprises in the mail to her, and I think she likes receiving them…although, I did tease her when she was home for fall break that she’s taking them for granted! 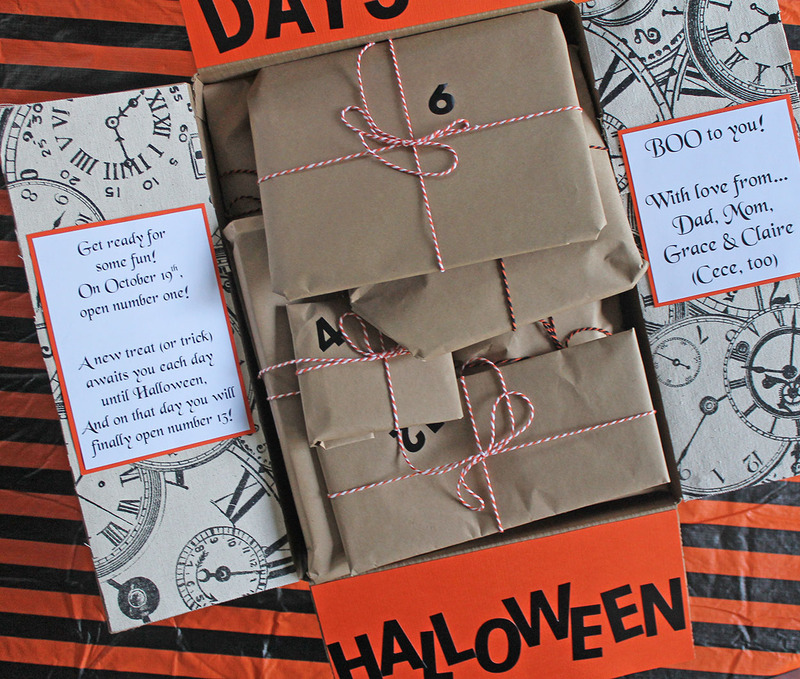 Today, I’m sharing my latest care package…a Halloween care package. 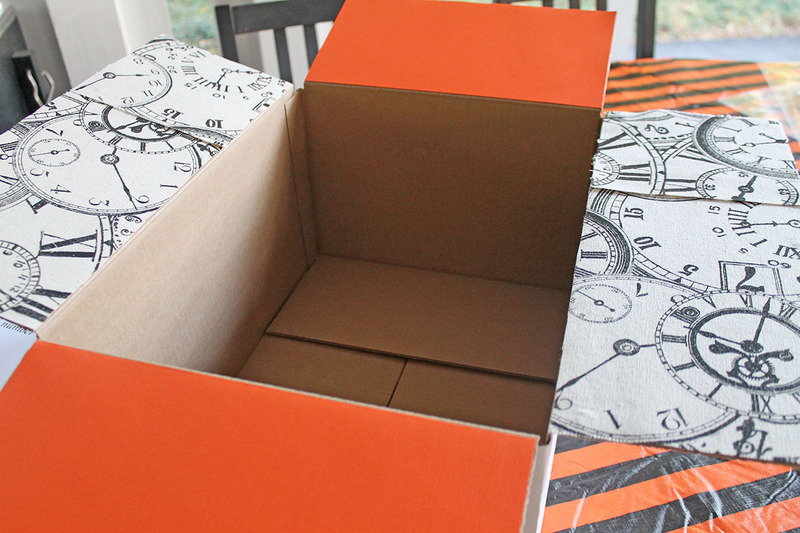 First, I decorated the inside flaps of the box in much the same way as the other package, by adhering cardstock to them. I used orange (of course) and a black and white pattern of clocks. 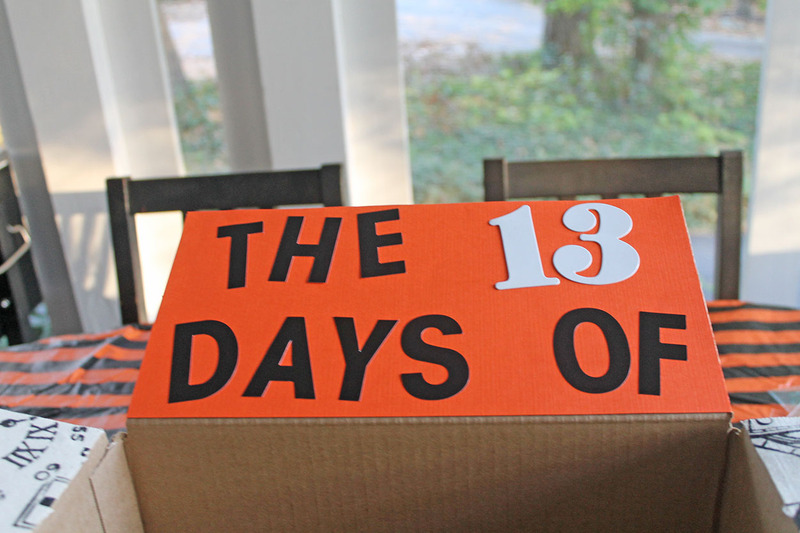 I thought it was appropriate since this is a countdown box, of sorts. 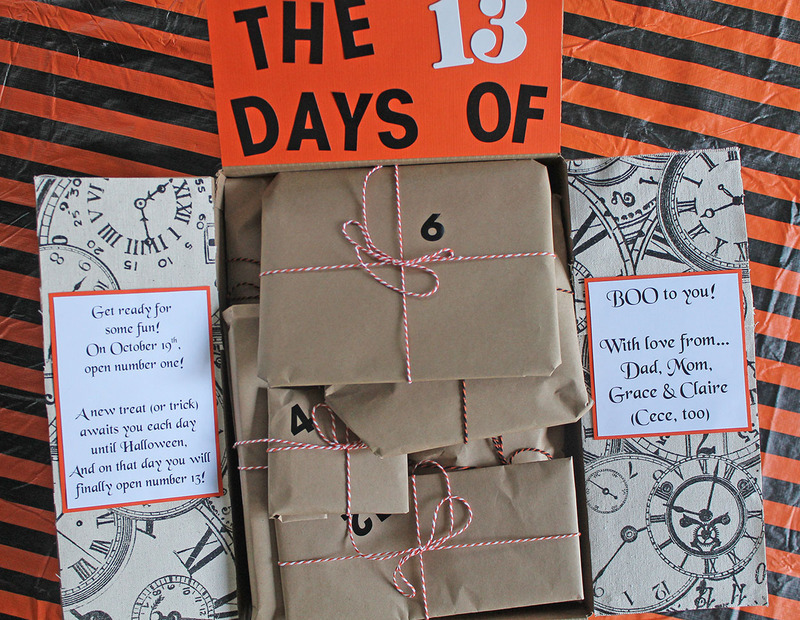 Some adhesive letters were put on the box flaps, giving the package a name…THE 13 DAYS OF HALLOWEEN. 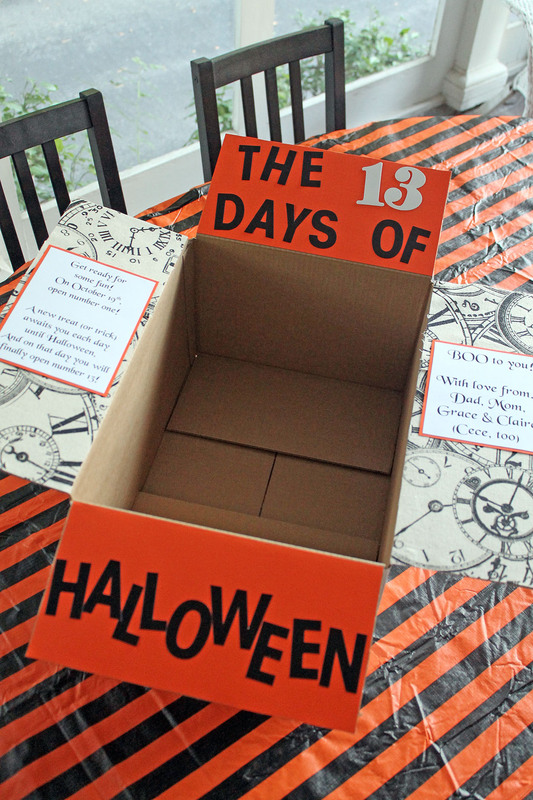 Wording was added to the box flaps, with instructions to open one “trick or treat” each day until Halloween. 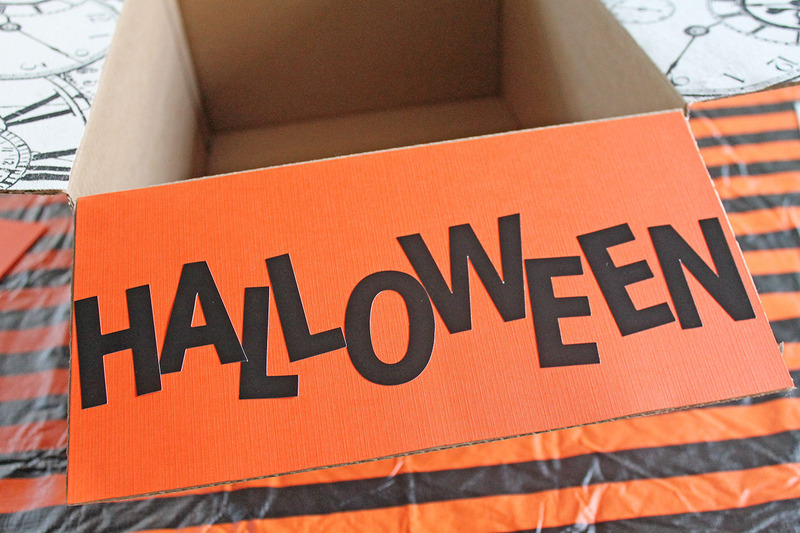 Next, I filled the box. 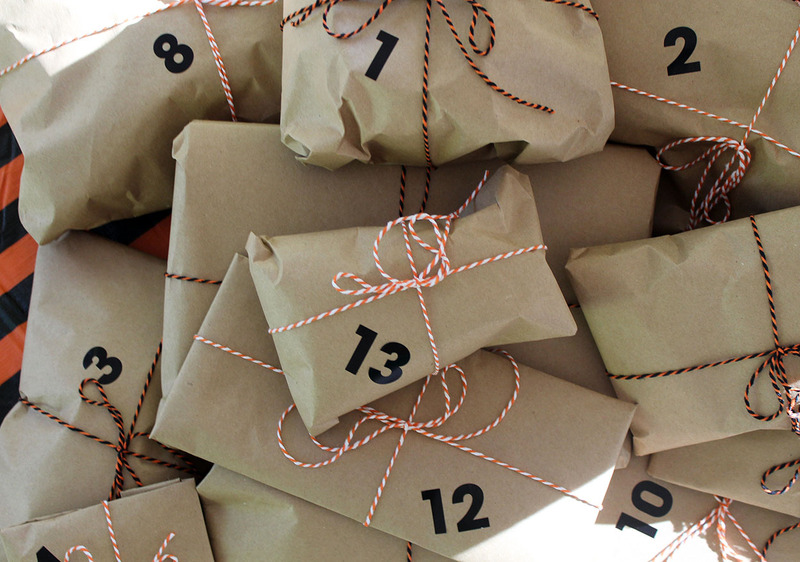 I wrapped 13 surprises in brown kraft paper and tied them with baker’s twine. Then each one was assigned a number. 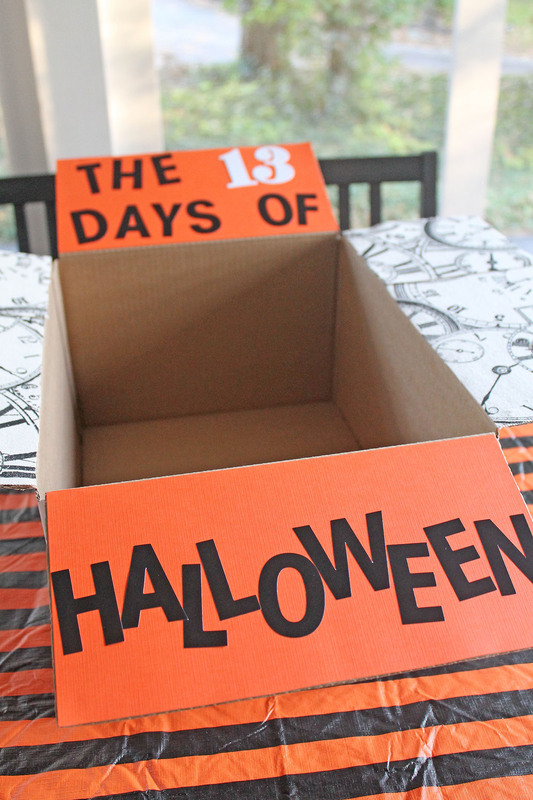 The directions say to open #1 on October 19th and then one each day. 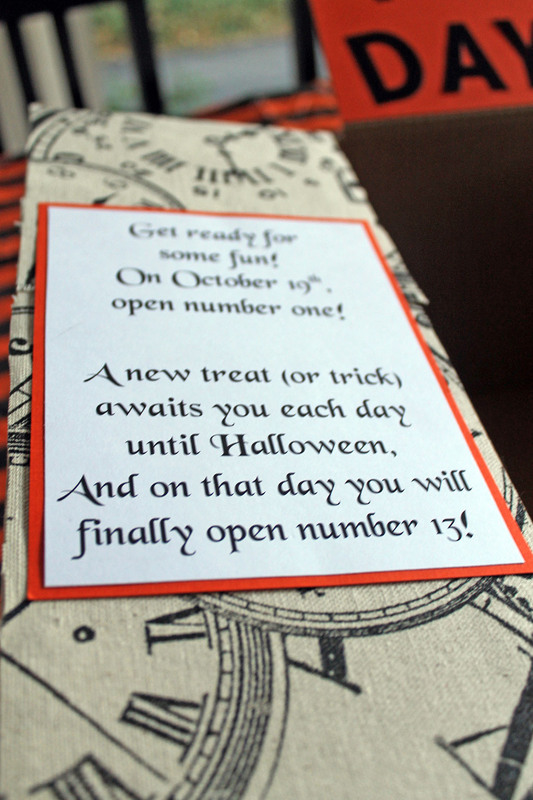 That means #13 will be opened on Halloween! 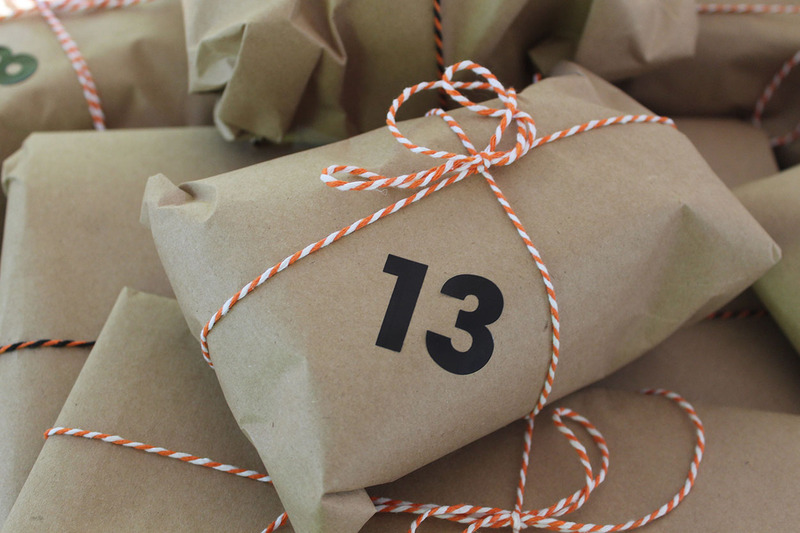 A box of 13 fun surprises for the days leading up to Halloween! 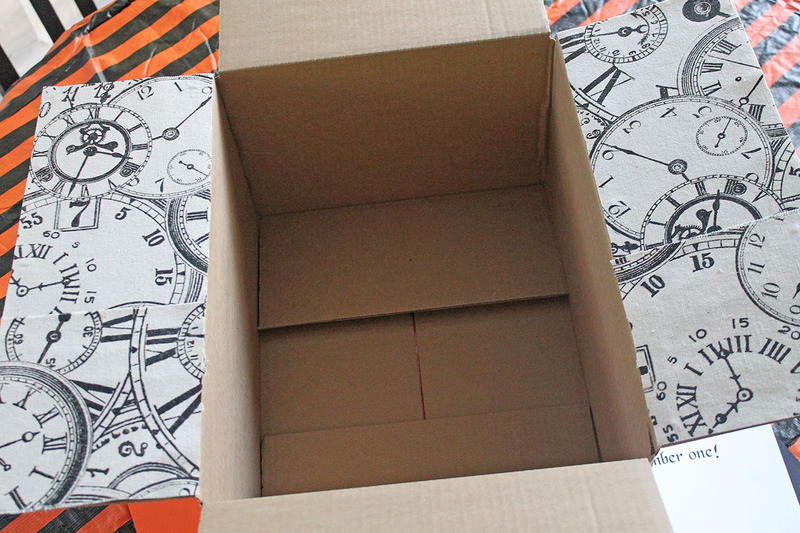 All that is left to do is seal the box and mail it! As a mom of a college student, you put me to shame Beth!